To be successful, one needs to emulate the attitudes of past successful men and women. Indeed, the achiever's attitude is an essential part of reaching your goals and fulfilling your dreams. There are numerous attitudes of achievers, and the consequences of this attitudes is what qualified them to be called achievers, and in other to be successful like them, it is important to cultivate those unique attitudes. stand between them and their goals, yet they realise how uneasy this are and it was persistence that has always helped them. Most of the lines in this piece are originally tweets from one of my numerous #ayospeaks series on twitter. But I considered putting it together in this form so everyone can read especially those not on twitter. No man with a man’s heart in him gets far on his way without some bitter, soul searching disappointment. Happy is he who is brave enough to push on to another stage of the journey, and rest where there are living springs of water, and three score and ten palms. I considered using the quote above to drive you into the realm of my ideology on the subject at hand. There are so many challenges in life, especially to those who have great visions, big goals and magnificent aspirations. There is no way anyone, even the rich, can scale through the ocean of life without experiencing whirlwind, but I believed our ability to keep the faith and stay focus always made the difference in our lives. Persistence is the ability to maintain action regardless of your feelings. You press on even when you feel like quitting. When you work on any big goal, your motivation will wax and wane like waves hitting the shore. Sometimes you’ll feel motivated; sometimes you won’t. But it’s not your motivation that will produce results — it’s your action. Persistence allows you to keep taking actions even when you don’t feel motivated to do so, and therefore you keep accumulating results. Friend, giving up is so easy. Anyone can do that. I mean people do it all the time. For example, I do it, you too must have at one point, and all of us do. We surrender. We throw out the next possible opportunity sometimes, simply because we fell down in some way or another, or because someone else finally wore us down with their repeated message that we couldn't succeed. Surrender is practically a national sport, it seems, especially, when the well of motivation has dried up in our environment and no one to encourage even with a thumb up. But we always miss the fact that even at any point of giving up, persistence will ultimately provide its own motivation if we allow it a space. Persistence is a trick worth nurturing. If we can keep at something and if we can find and rekindle that little spark of faith within, we will build, or rebuild again and again. I remembered when I was preparing for my trip down here (UK) from Nigeria, I heard a lot on my to-do list, I have called friends to make a lot of enquires and I drew the plan in a very glorious way. I set aside some funds to ensure I realise them without any restrictions. Although, it’s my first trip actually, I don’t really know how UK looked like and what am going to meet, but I heard great expectations, and determination to pursue my vision no matter what. When I touched down, I realised that the situation around my new environment was completely a different story from what I use to hear. The challenges that first presents themselves instantly replaced my original plans and aspiration on my to-do list. At a point, I became so frustrated because nothing was really working out the way I wanted, the way I have planned them and the way I dreamed they will work out. It came to a point that I began to consider doing something else, in this case, what the environment presents but the passion I have for my vision won’t allow me to. So I dinted myself to keep believing. I kept the faith and stayed focus until when the opportunities starts presenting themselves and I neatly embraced them with actions. If I give up, no one will ask me why, and there was no one around as well to encourage me, but I kept trying, believing I will get it right soon and at last, I did. The point here is this: disappointments are irresistible, challenges are unavoidable and change is inevitable. When we work on any big goal sometimes, our inspiration may wax and motivation may cease, but patience, perseverance and persistence can help us to scale through. Overcoming our challenges and tough times are the experience which qualifies us for a successful end. If we simply keep taking actions, we’ll eventually get results, and results can be very motivating. I understands that persistence is hardwork. It’s not that easy to keep faith and be patient with what is not working. But if we believe in our vision, and we've got the evidence that it will work someday, why not keep trying, that day may be the next time we try. Persistence is not when we are waiting, when we are busy doing nothing, it’s not when we are patient looking for the right time to do something. Persistence is an act of doing while waiting for our expected end. Too many of us wait to do the perfect things; with the result we do nothing. The way to get ahead is to start something. While many of us are waiting until conditions are “just right” before we go ahead, others are stumbling along, fortunately ignorant of the dangers that beset them. By the time we are, in our superior wisdom, decided to make a start, we discover that those who have gone fearlessly on before, have, in their blundering way, travelled a considerable distance. If you start now, you will know a lot next year that you don’t know now, and that you will not know next year, if you wait. Persistence is the deliberate action of doing something, doing it again, and again, until we get it right, and maybe doing it over and over after that, too. It is the act of building continuity. 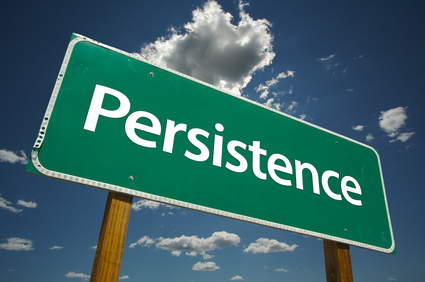 Persistence is a powerful state to consider. If you can find the discipline to persist, then you've got a power that many seem unable to master. The power is in you, turn it into a habit. This week, Remember winners don't quite, achievers don't give up. Quotes Ref: Brown, Steve, Harriet Beecher Stowe and The William Feather Magazine. Certainly winners don't give up. Keep up with the good work. I'm richly blessed by this. Giving up is so easy. It's the foolproof way of fading into the mass of mere followers, depending on the crumbs from the table of those who mastered persistence. Well done Ayo.